These Low-Carb Snickerdoodle Cookies are so delicious and a perfect dessert to enjoy around the holidays! There’s just something about warm, soft cookies that make the world go ’round. 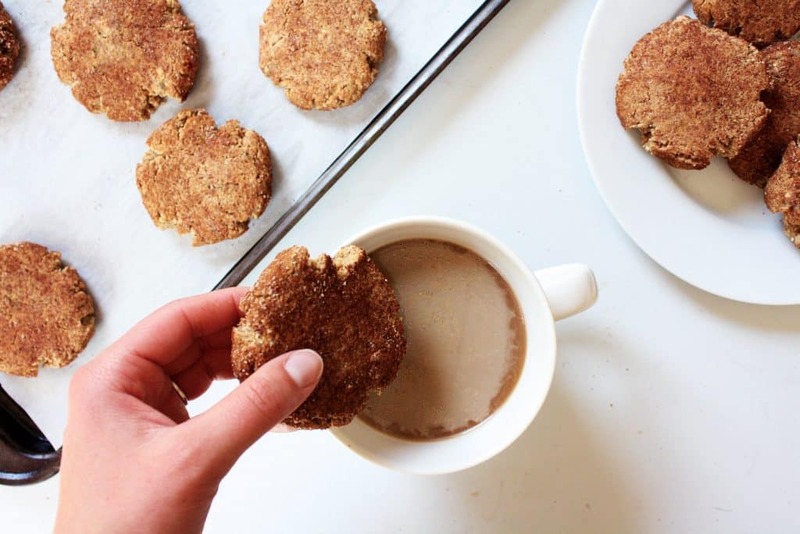 I grew up eating snickerdoodle cookies and when a recent craving for one hit, I knew I needed to develop a recipe that was low in carbs, gluten-free, dairy-free, and refined-sugar-free, and tasted amazing. 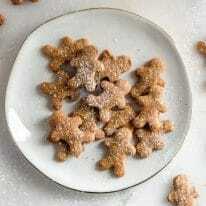 The final result is one for the books: a melt-in-your-mouth cookie encased in a cinnamon sugar coating. Yes, please! For these Low-Carb Snickerdoodle Cookies, I used almond flour and coconut flour, monk fruit sweetener, and coconut oil rather than white flour, cane sugar, and butter. 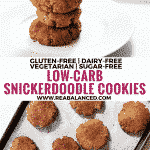 In doing so, each cookie contains more than 7g of protein and less than 4.9g of net carbs! The benefit of substituting flour, sugar, and butter for real food ingredients is substantial. Not only will one of these cookies refrain from spiking your blood sugar from 0 to 60 in half a second, ingredients that are made from real food are not only better for your health, but will keep you satiated while still satisfying that sweet craving. In this recipe, I use monk fruit sweetener rather than a higher-carb sweetener, as the consistency is incredibly close to that of cane sugar and I tend to prefer the taste of it in baked goods rather than stevia. Monk fruit sweetener, like that of stevia, contains 0 calories, 0 grams of carbohydrates, and rates at a 0 on the glycemic index, making it a safe option for diabetics. If you’ve never tried monk fruit sweetener or just need to re-stock your pantry, you can use the code “REALBALANCED” for 20% off your Lakanto orders! Did you know that a primary ingredient in baking powder is cornstarch? Personally, cornstarch is an ingredient that I avoid as it results in adverse reactions. If you follow a paleo or grain-free diet, baking powder is a sneaky ingredient that may be causing you digestive, joint, or other issues; this was true for me, at least! Cream of tartar is the perfect substitution for baking powder. Like that of baking powder, cream of tartar is an acid, an important component in baked goods. With a little extra baking soda plus some cream of tartar, you can prepare a homemade paleo and grain-free baking powder substitute! This is the brand of Cream of Tartar that I use. If you’re like me and bake often, buy it in bulk so a) you save a ton of money in the end, and b) you won’t have to worry about running out for at least a few decades. Win, win. A common misconception and a question I receive often is whether almond flour and coconut flours can be substituted for one another. No, unfortunately not. 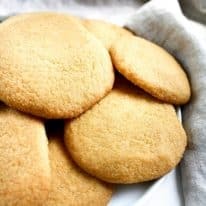 They are two entirely different types of flours, but do work really well when paired together in the same recipe like they are for these cookies. It is waaaay more budget-friendly to buy these flours in larger quantities because it’s easy to use an entire small bag in just one or two recipes. I paid a little more up front for my almond flour and coconut flour and have saved SO much money in the end. That 4 pound bag of coconut flour is basically the best deal for the stuff I’ve ever come across. 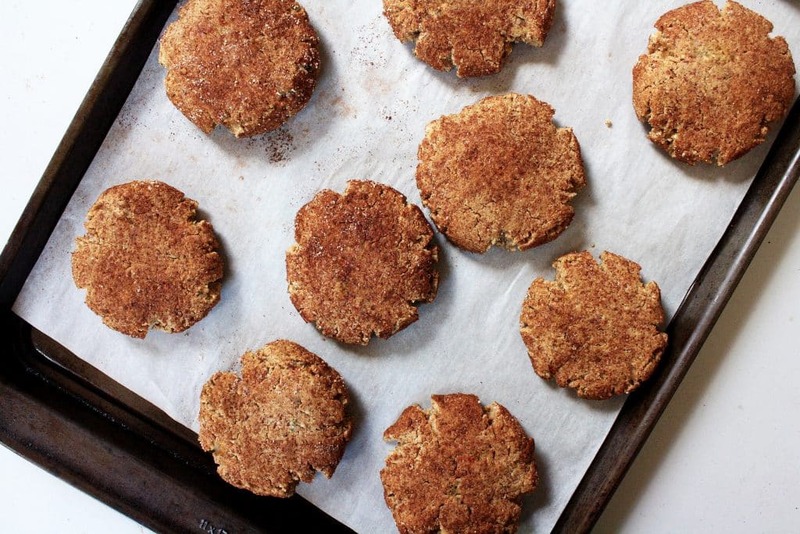 These Low-Carb Snickerdoodle Cookies contain 4.9 grams of net carbs per serving. 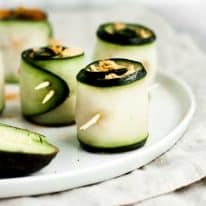 This recipe is low-carb, paleo, gluten-free, grain-free, dairy-free, vegetarian, and refined-sugar-free. Find all Real Balanced low-carb recipes here! 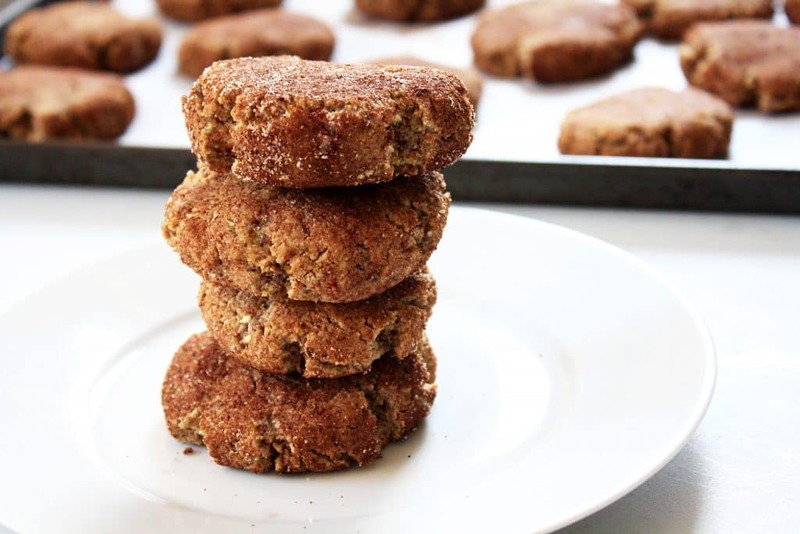 These Low-Carb Snickerdoodle Cookies are a delicious treat to satisfy your sweet tooth! This recipe is low-carb, paleo, gluten-free, grain-free, dairy-free, vegetarian, and refined-sugar-free! With an electric mixer in a medium-sized bowl, combine eggs, vanilla extract, almond butter, almond milk, and coconut oil. In a separate medium-sized bowl, whisk together dry ingredients. In small batches, add dry ingredients to wet ingredients and, using your hands, combine until dry ingredients are fully incorporated. Place batter bowl in refrigerator to chill for 15 minutes. Once chilled, form batter into medium-sized balls, roll ball in cinnamon sugar coating mixture, and place on baking sheet. Once all balls are formed, using the palm of your hand or the bottom of a glass, flatten balls into cookies.